If you’ve done any reading in personal finance, the idea of an emergency fund isn’t new to you. Having money set aside for a rainy day is not a new concept. Ever since we were first married and started budgeting, we had had an emergency fund. When an “emergency” came up, in most cases, we were able to pull money from other sources and not use our emergency fund. We wouldn’t let ourselves touch that money except in absolute emergencies. In the spring of 2013, I first read Dave Ramsey’s Total Money Makeover. The first of his “Baby Steps” is, not surprisingly, an emergency fund. Before diving into attacking your debts, Dave recommends putting aside $1,000 in a “baby emergency fund.” He says that most people who follow his program and are “gazelle intense” will get out of debt in 18-20 months. Upon deciding to get serious about our student loan payback, we had an emergency fund of just over $6,000. The idea of cutting it down to $1,000 made us (especially me) very uncomfortable. Here are a few of the reasons why we decided against a $1,000 “baby emergency fund”. We knew that $130,000+ of debt would take us longer than the average 18 to 20 months to pay off with an income of $39,000, even with our intense payback plan. We have a high deductible health insurance plan, which means that all of our health expenses are out of pocket. Our deductible is $7,500, so we wanted to have somewhere near that much available in case it’s needed, though we are generally very healthy. Our policy doesn’t comply with new insurance laws, so it will be interesting to see how things change. Update: How our insurance situation has changed under the ACA and then it changed again. We have kids. When we were single or without children, we could fly by the seat of our pants much more easily. Now that we have a family to take care of, we (I) need a little more security. We are not done having kids. We are not putting off growing our family because we have student loans. I imagine we will have at least one more little one while we are paying back debt. Of course, having a child isn’t an emergency, as you have 8 months or so to plan for it, but knowing that in the next year or so we will be using all of our deductible to have a baby, we may as well hold on to what we have already saved. We decided to keep the $6,000 we had in our emergency fund rather than contribute $5,000 of it to our debt payoff. We have already paid a couple doctor’s visits and $1,000 of a root canal (more to come) from our emergency fund and are down to $4,700. In the new year, we will build our emergency fund back up. If you are paying off debt right now, are you going with the standard $1,000 Baby Emergency Fund? I actually wrote a post about this last week – how I needed more than that size Emergency Fund. I don’t have children, and I don’t have as much debt as you, but there are a lot of unknowns in my current situation, but I don’t currently have insurance, or a very stable job, so I feel much more comfortable keeping the $5400 sitting in an account rather than playing roulette. I totally agree! Sure the money could be used to pay debt a little faster, but when your situation has lots of unknowns not having a big enough emergency fund will just mean you’ll have to get into more debt to take care of those emergencies. Psychologically I think it’s better to hold back a bigger emergency fund now and avoid more debt in the future. I’ll have to go check out your post! I think you’re making the right choice! We have $5k in savings right now and I cannot imagine dropping down given our high deductible health insurance too. Thanks Michelle. It would be terrible to have to add to the debt because of a health issue. I do NOT for the life of me understand a $7,500 insurance deductible. Holy crap. If I lived in the US with children I would also have a larger ER fund as well. A big reason I can sleep at night is because I will never have to decide how sick me or my family is before I head to the doctor at zero expense to me. Universal healthcare and health insurance that is provided to us by my husband’s job (for prescription meds) combined with job security is why we can get away with a small ER fund for now. They’re not a one-size fits all! Catherine, your plan sounds great for your circumstances. Because our fixed expenses are pretty low and we have a sizable amount of food stored up, our emergency fund is primarily there just for medical expenses. If you don’t have the risk of high medical expenses, I’d agree that you can certainly keep a smaller amount aside. Just a note on our insurance plan since we’ve actually found a high-deductible plan saves us a lot money and it might be of interest to someone. Each month we pay $453 in premium (a total of $5,436 per year). This includes all preventive care at no additional cost to us. It also buys us a maximum out of pocket amount of $7,500 for the whole family ($3,750 per person), which is an amount we can reasonably plan for via our emergency fund. A plan with comparable coverage but a $1000 deductible would cost at least $1,200 a month ($14,400 per year). After we paid off the first $1,000 insurance would cover 80% of the remaining bills, leaving us 20% up to a maximum out-of-pocket of $5,000. Let’s run that through a few scenarios. Scenario A: During the year, we do regular check ups for the kids and annual physicals for the adults (all covered 100%). We also have two other doctor visits with some lab work and one prescription, totaling $940. Under our current plan, the total cost for health care is $5,436 (premiums) + $904 (since that’s lower than our deductible) = $6,340. Under the comparable lower-deductible plan, our total cost for health care is $14,400 (premiums) + $500 (deductible) + $80.80 (20% of costs after the $500 deductible) = $14,980.80. Yikes. Scenario B: During the year, we do regular check ups for the kids and annual physicals for the adults (all covered 100%). We have the same $904 in costs as Scenario A, but we also have another baby and it’s a complicated premature birth. Mom and baby costs total $850,000. Under our current plan, the total cost for health care is $5,346 (premiums) + $7,500 (our maximum out of pocket) = $12,846. Under the comparable lower-deductible plan, our total cost for health care is $14,400 (premiums) + $5,000 (our maximum out-of-pocket amount) = $19,400. In either year, when we have minimal or extremely high medical expenses, the high-deductible plan ends up costing us less than the low-deductible plan. Our insurance provides us protection from the possibility of extremely high bills at a relatively low cost (for a family of five in the U.S.) to us. Now, if we were in Canada, that might still seem like a crazy amount, but down here it’s about as good as we can do when searching for our own plan. Of course, on January 1, 2014, our plan disappears as “substandard” under the Affordable Care Act. As we become part of a national pool of individual insurance buyers along with older and less healthy folks, our premiums will be going up substantially. There may be a way to take advantage of the promised income-dependent subsidies, but it’s still not clear. I’ll post an update for anyone interested once we figure out what our new plan will look like. Hello, I’ve started reading your blog recently and was wondering what if anything has changed as of 2014 with your health insurance situation. You said the plan you had last year would no longer work in 2014. Have you tried shopping for plans on the Marketplace? Hi Dave! As of January 1st we have a new plan through Covered California. We’re actually working on a post with all the details of the change in our health insurance costs and coverage and what it means for our budget. It should be up some time next week, so stay tuned 🙂 UPDATE: The post on insurance is here. We did the same thing! We started with $173k in debt and kept our emergency fund at $7k. We also have a high deductible health plan, and living in California just the rent on our small 1 bedroom apartment is $1300. A $1000 emergency fund wouldn’t even cover one month’s rent if something crazy happened and both my husband and I lost our jobs (unlikely but still). Our plan is to use the money when we only have $5k left on our loans. Then we can just start building up the emergency fund again the next month. Clarification: Our plan is to use the money to pay off the final $5k of debt, not just spend it on whatever! The sounds awesome Courtney! Between a high-deductible insurance plan and a high rent (compared to other places in the country), just having a $1000 emergency fund would be a little crazy. It will be feel so great to use it on the last bit of debt though, like a sprint to the finish line! Agree Completely! I understand that there are people who have never had a savings of $1000 for emergencies, so for them its a start in the right direction. We are debt-free except our home so we prefer to have approx. $20,000 in an emergency fund. This would be for a job loss, etc. Thanks for your blog. It’s encouraging us to try and pay off our house as soon as possible! Yes, if you have never set aside money before, it’s a great idea to do at least have $1,000 before getting serious about your debt (otherwise you’ll likely keep racking up the debt), but it is just a start and not one-size-fits-all. That sounds like a wonderful emergency fund. Congrats on not having debt other than your mortgage! Good luck on your journey to pay it off early! Every family’s situation is different. Do what you think is correct. Yes, I would be wary of reducing my emergency funds. Yes! Just $1,000 won’t go very far for most people, but it’s better than nothing. I think $1000 is a good idea for an EF if you’re new to saving/budgeting. I know a lot of people have a hard time just making it to that amount. Like you we have a larger EF. I just feel more comfortable with having a larger EF because we were faced with downsizing back in 2008 and jobs are not guaranteed, so I want to be sure we always have enough to take us through a few months of unemployment. $1000 wouldn’t even pay our mortgage! Our deductible is 2500 on our health insurance and we have an HSA that we pay into automatically to cover that. I agree. It’s a good start, but it sure won’t cover much if there are real emergencies. That’s so nice that your HSA takes care of your deductible and that you pay into it automatically. I always assumed Ramsey’s “baby emergency fund” thing was for people who hadn’t already saved an emergency fund—you know, give yourself a target to at least get started on saving. I would never consider chopping down my emergency fund—especially knowing my car is going to go kaput any day now, and there’s no public transportation where I live—just to put an extra payment onto my student loan. (Especially considering that emergency fund is money I’ve been accumulating in the bank since I was a little girl!) I’ll absolutely put windfall checks toward that debt, but even though I could pay off half of what remains right now if I spent my emergency savings on it, I’d feel naked and vulnerable until I built it back up. Security means more to me than a little bit saved on interest. I shudder to think what a mess I’d be in if I so much as broke a bone with only $1000 socked away. Thank you Elizabeth! “Naked and vulnerable” says it perfectly! Security is a big deal. We also have an emergency fund much higher than $1000. I think Dave just wants people to get to that number who are starting at zero, and then move on to debt. And then after they pay off non-mortgage debt, they should increase their fund. For some, $1000 is very difficult to get to, but I agree, it is too small for us also. We are self-employed and on more than one occasion have had to dip into our emergency fund just to pay our bills for a month. We also have a very high deductible ($10,000) just to be able to afford our monthly premiums, so we have that on hand too. Thanks Kristia. If you are starting without an emergency fund, $1,000 is a fine place to start and for some it’s enough to get them through their debt payoff, but others, like us, need a bigger buffer. Thanks for stopping by Sarah. Emptying our emergency fund would make me nervous too. Definitely every situation is different. That’s awesome that you worked hard to get the debt paid back in a year! I’m glad you found my blog! 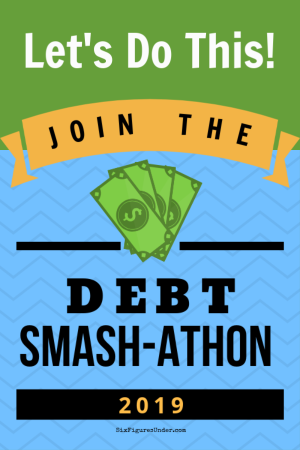 It really is encouraging to know of others who are making sacrifices to be debt-free. Thanks for stopping by and commenting Caitlin! We also choose to have a larger emergency fund. The baby emergency fund of $1,000 is an easy goal to obtain. To give you a win feeling under your belt. Which helps give motivation for those feeling stuck. When we decided to have a larger fund we did it by making three different goals. GOAL 1 was the baby emergency fund $1,000. GOAL 2 was to cover all fixed expenses $3,000. GOAL 3 was to cover one months income $5,000. So we have a one month buffer in case something goes terribly wrong. We decided something similar because even though our household income is very good ( above $150,000), our student loan debt is $125,000 and we have two young kids in preschool. We decided to make our emergency fund $10,000 before attacking the student loan debt with a vengeance. Thankfully we don’t have any other debts so once the student loans are gone we’ll be 100% debt free! I am doing the baby emergency fund because I have care credit which is a credit card with a high limit in case emergency pops up… The interest is free for the first year and together my husband and I have $10k limit. I’d look io something like that…. Maybe it is a credit card per say, but I will have it in an emergency instead of sitting on cans that can save me money. I love your blog! I am currently stay at home with my daughter and will start working in a couple months again, but my year off has taught me what we can do with one income and were able to focus on debt repayment. It’s hard as far as how aggressive I am with it lol so it’s a little frustrating waiting for the paychecks and bonuses to come in knowing where it will go! I’m 27 with a good amount of debt, with an aggressive plan my repayment is 5-8 years…I don’t think being 35 is too late to live debt free! It’s never to late! You’re right– it’s never too late to live debt-free 🙂 Keep up the aggressive repayment! While our credit cards do have high limits, we are faithful at always paying them off each month. We use credit cards for their convenience, protection, and rewards. Since we’re working so hard to pay off the student loans, we don’t want to add any credit card debt to the mix. Even though our “toddler” emergency fund (a little bigger than a “baby”) isn’t earning us much interest now, it gives us peace of mind knowing it’s there in case we need it, so we won’t have to go into debt. We have built the emergency fund and spent the emergency fund. It’s built back up again right now, but we have a vacation coming up in which we will most likely spend the emergency fund once again 🙁 It has definitely come in handy. However, we did manage to pay off our debt without quite having the emergency fund at hand (we also managed to have a baby and put a downpayment on a house while being still in debt). We now have no debt except the mortgage, and after vacation will be beefing up our emergency fund. I’m with you that in your situation having a larger emergency fund is a better plan, and an extra $5,000 won’t quite make a dent in your student loan payment of 6 figures! Sounds wise to me. I recommend you set aside a vacation fund next time cos the emergency fund isn’t supposed to be spent on vacations (unless an emergency comes up of course). We used to take money from the emergency fund for non-emergencies but we have learned to stop doing that. Yes, I would recommend creating a “vacation fund” in addition to your “emergency fund” to set money aside specifically for your trip. Your emergency fund is just there for unforeseeable circumstances where you have no other way to bail yourself out. I absolutely agree with you. We are in a situation where we had to move for work, and our previous house isn’t sold yet. We have rent & a mortgage. The septic at the home we owned needed serious work. It cost $1200. Fortunately, we had more than $1000 set aside. Otherwise, we never would have been able to build it back up. Once we sell our home, we will breathe a sigh of relief. That’s a tough situation to be in, having a house that hasn’t sold yet. I’m glad you had an emergency fund! Best wishes for getting it sold soon Stacy! My husband and I follow Dave Ramsey also. We were lucky when it came to our debt, we were both in the military when we got married and we opted to take my bonus and by a 5th wheel and lived in it for 5 years while saving as much as we could out of each check. While deployed overseas the military stored out vehicles and other property (as required). We paid to have the 5th wheel in storage and paid the lease on our truck, everything else went in the bank. It was crappy at times but now we own a house and have two wonderful boys. Good luck, you’ll have it paid off in no time. Wow Leslie! That’s impressive! I’m sure there were some really tough times (and some great memories), but you got through and have a happy ending now. 🙂 Thanks for sharing your experience. I appreciate your encouragement! Hi! I enjoyed your post and I agree that $1,000 in an emergency fund is not enough. But as someone who teaches the Dave Ramsey Financial Peace (now called Foundations in Personal Finance in school curricula) every semester, I’ve never heard Dave say to stop at $1,000. He stresses that that should be the goal of someone just starting out, just like he recommends $500 for a teenager or college student. Once someone has a full time job (and certainly once you have children, a mortgage, etc.) Dave advocates an emergency fund of three to six months of expenses. This would fluctuate widely based on your income, but he gave the example of at least $10,000-$15,000. I believe he advocates saving toward this goal even before your have paid off your debt snowball, or at least that is how I interpret his teachings. It really is personal I guess! For us $1,000 is far too little, but $10,000 is too much for us now while we are concentrating so hard on getting our student loan debt paid off asap. $4,000 to $5,000 in our emergency fund is working well for us right now. It helps that we don’t have any minimum payments on the student loans (because of income-based repayment), so if an emergency comes up, we also have available the $1,000+ we plan to put toward debt each month. I am very excited to read all of your ideas. Keep up the good work. I was led to this site today from another forum. My wife and I have been on this “journey” for 4 years now and we keep learning more, succeeding, failing, and trying again. I am glad we didn’t cut back our emergency fund either. My husband and I planned our pregnacy, but we did not plan on getting pregnant with twins! While we are excited this means the added concerns of bedrest, visits to specialists with more monitoring than a regular pregnancy, and possible NICU costs depending on how far along when they are born. We are spending $400 a month just on our portion of the specialty ultrasounds (which would be around $2000 if we didn’t have insurance). Fortunatley we have the funds to cover it, but we would not have if we followed Dave’s advice. Great example Amy! I’m glad you went with your instinct to keep the emergency fund up. There’s enough other stress that comes with a baby (let alone two at once! ), that it’s nice you don’t have the extra financial burden. Congrats on the twins!! I agree that $1000 may not feel like enough for most people (myself included), but I think that’s the point. Having only $1000 for an emergency fund is supposed to make you uncomfortable. So uncomfortable that you are willing to go to extremes to pay off your debt faster. When you feel comfortable, you get lazy about paying off the debt. You start buying Starbucks every morning. You go out to eat. You buy a new flat screen TV. You go on vacations. I think the point is to get “Gazelle Intense” and find ways to save money every day and make more money every day, then throw all that money at your debts to pay them off as soon as possible. I can see where you’re coming from Carl. For us, our big “uncomfortable” that keeps us motivated is that we are living in my in-laws’ basement with our 3 kiddos. We are staying until we get our student loans paid off. We are really eager to get our own place, which keeps us on track! I have $1120 in my emergency savings. I took $1100 out to pay down debt and so far it’s been a good move. 🙂 My interest rate on my debt was much higher than the interest I was receiving on my savings account. Nothing has happened yet, but I am healthy, single, no dependents, and a fairly stable job so it’s easier for me to do than for others.